Woah. I was not expecting to love this book so much. I had avoided it for so long but finally the hype got to me - and I'm glad it did! Scythe was so well crafted, original, and addicting. The world Shusterman built was so believable even though I was skeptical from the description. This utopian (if you discount the scythes) world was so interesting. I can't wait to find out more about the Thunder Head - the creator of this utopian world in our future. Now, onto the most interesting part: the scythes. Wow. They were scary, disturbing, and horrifying. Some were downright evil and others I grew to respect. Shusterman really got into my head and I couldn't stop think about the ethics of death. From the very first Scythe journal entry, I was fascinated. The characters are also well developed and I was rooting for each one. I won't say much more but I was majorly impressed with the morals and conscience of both Citra and Rowan. (Although there were definitely times I was worried about Rowan.) And there's a hint of romance! And, although the main characters were awesome, I was also blown away by the complexity of the older scythes such as their mentor, Scythe Faraday. I really would just recommend this book to everybody. There isn't a book on the market quite like it; you are in for a harrowing but amazing experience. 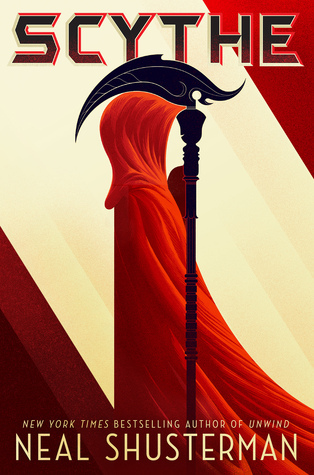 Don't worry about the synopsis and just give Scythe a go! You won't be able to stop flipping the pages.